Carol has chosen this theme for our new challenge at Inkspirational. For my DT card I used a character from a dingbat font, enlarged it , layered it and cut it out using my Silhouette cutting machine. To be honest, I'm not sure if it's a child dressed up in a clever costume or a slightly spooky , yet cutish, being. You decide. 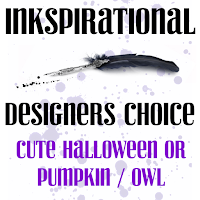 Please visit us at Inkspirational , see what our DT and fabulous Guest Designer Becca have made, and enter your own cute seasonal project. I think the wonky face makes it a spooky being....I think!! Like how you used the DSP for the costume and panels and toy are right, the Halloween cards are flying across the pond!! WHat a fun card ... made me smile! Whatever he is-he's cute! Thanks for joining us at Aloha Friday's Halloween challenge! Cute image and fantastic colorcombination! Thanks for playing along with our Cardz 4 Guyz Challenge for this week and good luck! 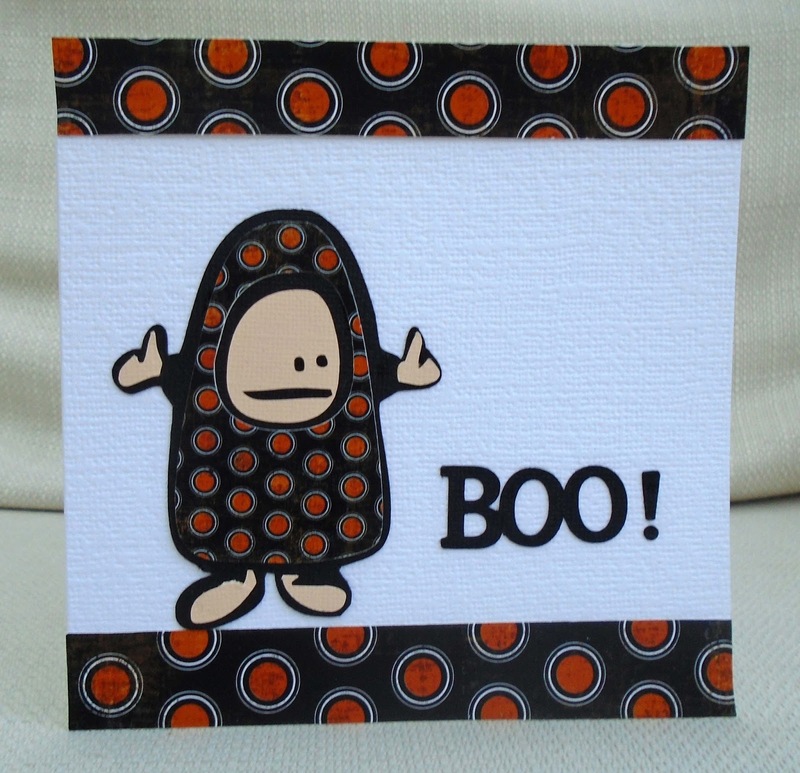 I think it's a super Halloween card - love the spooky being! Great papers! Thanks so much for playing along with our Halloween theme at The Male Room! I think he's more cute than spooky, he kind of looks a bit lost in his big outfit, which makes him even cuter. Great paper piecing! 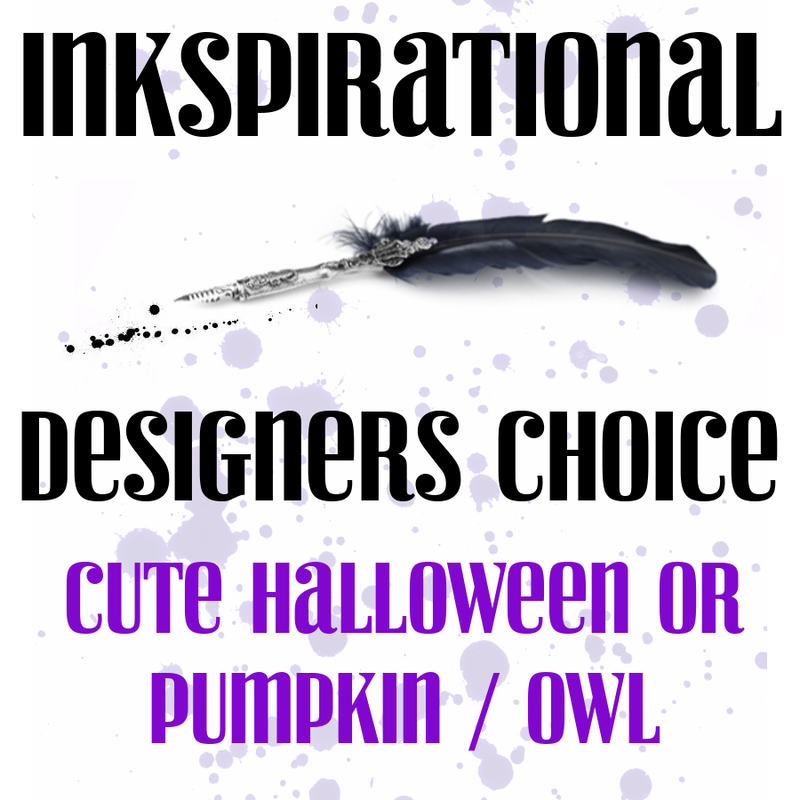 This one made me chuckle, Marina - great fun Halloween design. Thanx for playing along with us at Cardz 4 Guyz this time. Hahahahahahahah....LOVE this, Marina! Whether a dressed-up little one or an 'alien' being, it makes me smile! It's all about the polka-dots! Hi,hi, this is really not so spooky love it. Thanks for joining us over at ATCAS. So cute, love it for Halloween! Thanks for joining us at Kitty Bee's Aloha Friday! Made me smile :) what a fun card! Thank you for sharing with ATCAS!